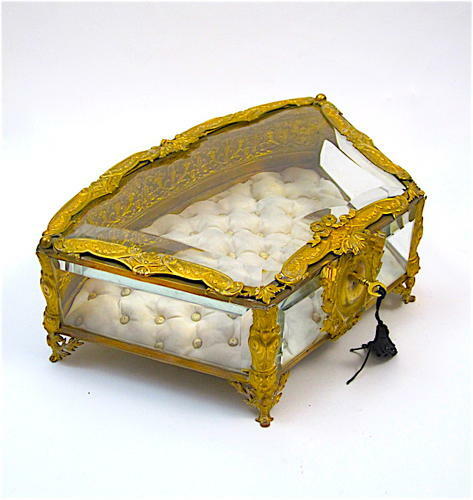 Unusual French Napoleon III Dore Bronze and Crystal Fan Shaped Jewellery Casket with Original Key and Original Silk Interior. Flowers, Classical Wreaths, and a Central Bow Decorate the Top Panel. The Back Panel Very Finely Engraved with Flowering Cornucopia Alternating with Double Handled Classical Vases. The Interior Lined with French Silk. Includes Key in Working Order.